Based on a long-standing “I should probably see this, because I enjoyed the Sly movie well enough, played the RPG once, and love Karl Urban in just about anything” desire to watch this one, I was finally nudged over the edge by a recommendation on G+. So I watched it last night. Dredd as played by Karl Urban was a bit more multidimensional than I’d have thought. I was surprised a bit by his “be gone when I get back” line to the beggar. I also didn’t get quite the level of fear of the Judges that was conveyed to me in the RPG. I played this once in High School, and our GM told us after a long, drawn-out shootout that had we just shouted out “OK, SKEGS! WE ARE THE LAW!! PUT YOUR FACES ON THE FLOOR OR FACE SUMMARY EXECUTION” that we could have likely bypassed the entire shootout due to pure primal fear. That was my only real exposure to the source material. I did not find any completely egregious, oh-my-god-no mistakes with firearms handling or technology. Most weapons other than the (um) LawGiver pistols were conventional. The tactics used by the Judges weren’t completely idiotic, though they could have paid more attention to Apone from Aliens (“Watch those corners!”) in the Peach Trees maze. The basic plot – escape from a sealed deathtrap – was entertainingly simple, and gave the actors a chance to work with a known environment and explore it well. When the doors came down in the beginning, I found myself thinking – OK. That’s one way to go. But it worked for the movie, and was an important part for avoiding the usual pitfalls: why didn’t they call for backup? They tried. Why didn’t they just leave? They couldn’t. Why couldn’t they just turn off the building? It was actively under control by the Enemy. Why didn’t the bad guy magic users use their own spells against the PCs? They did. Constantly. I found Mega City One utterly believable, in that it was not wall-to-wall dystopia and dark, and many scenes could have been (and clearly were) set in any modern-day cityscape. There were giant buildings 2x the height of the old World Trade Center (which was 110 floors, IIRC from memory) but many times larger in cross-section. Note that the quoted population of Peach Trees was 75,000 folks. Unbelievable? Not at all. It’s only 375 folks per floor, and if the average dwelling is 3.75 occupants (for easy math), that’s only 100 units per floor, or 100,000 square feet if each unit was, on the average, a two-bedroom place similar to a NYC apartment. Seem huge? It’s only 100 yards on a side. The World Trade Center was about 70 yards on a side and was half the height. The buildings of Mega City One seem to basically be three cubes stacked on top of each other. If a story is 10′, more or less, and Peach Trees was 200 floors high (plus some superstructure which we’ll ignore for now), that means that the sideways dimension is on the order of 665′, or 200m on a side and 600m tall. It’s hollow-core, but even allowing for that, we’re likely looking at 30,000 square meters per floor, or about six million square meters, or 65 million square feet. That’s 865 square feet per occupant, suggesting that someone did their homework here. That’s either very, very large apartments (unlikely), or a density artificially lowered by it being taken over by a horrid criminal gang. Loved the part of rookie Judge Anderson, though there were one or two moments where I thought her powers were conveniently forgotten (but then again, distractions happen). Her plot arc was much more evolutionary than Dredd’s, of course – he’s the established character, and she’s the newbie. She gets the most room to prove herself and change, which – spoilers – she does. Lena Heady was credibly bonkers as the primary bad guy. She showed evidence of not being stupid, which was good, and combined at least some sense of long-term planning with a “social compact” score in the negative range. Utterly amoral and vicious, and reminiscent of a female joker without the makeup (though with the bloodstained smile). All in all, it was an enjoyable film, though not one to watch with the squeamish. There’s a lot of blood and slow-motion (or perhaps Slo-Mo?) scenes of bullet impacts and spouting squibs. I’d enjoy watching Urban and Olivia Thirlby reprise their respective roles. Awesome, awesome movie. 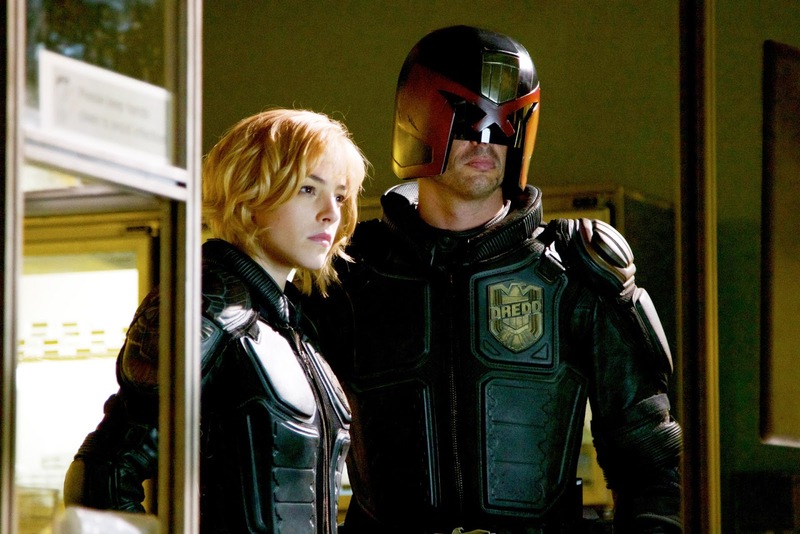 And mad props to Karl Urban for insisting that Dredd never removes his helmet during the movie.